From the first time I saw The Ringo Kid spin his Winchester around to the time I saw J. B. Brooks smile in aprovement of Ron Howard I have loved John Wayne Movies. When the Duke steped onto the screen you knew he was there. And when he got in a fight you knew who would win. Duke wasn't just an American he was America, he was what all Americans could be but so few are. 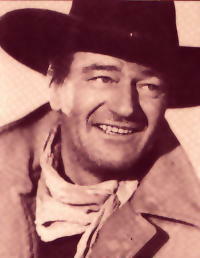 John Wayne was the greatest actor of all time. So take a look at my favorite movies, stories about the Duke, a weekly trivia question, a wav request, and a picture gallery. My page has been hit times.